This article is about the Libyan government. For the Congolese entity, see National Transitional Council (Congo). The National Transitional Council of Libya (Arabic: المجلس الوطني الإنتقالي‎ al-majlis al-waṭanī al-intiqālī ), sometimes known as the Transitional National Council, was the de facto government of Libya for a period during and after the Libyan Civil War, in which rebel forces overthrew the Libyan Arab Jamahiriya of Muammar Gaddafi. The NTC governed Libya for a period of ten months after the end of the war, holding elections to a General National Congress on 7 July 2012, and handing power to the newly elected assembly on 8 August. The formation of the NTC was announced in the city of Benghazi on 27 February 2011 with the purpose to act as the "political face of the revolution". On 5 March 2011, the council issued a statement in which it declared itself to be the "only legitimate body representing the people of Libya and the Libyan state". An executive board, chaired by Mahmoud Jibril, was formed by the council on 23 March 2011 after being de facto assembled as an "executive team" since 5 March 2011. The NTC issued a Constitutional Declaration in August 2011 in which it set up a road-map for the transition of the country to a constitutional democracy with an elected government. The council gained international recognition as the legitimate governing authority in Libya and occupied the country's seat at the United Nations. In referring to the Libyan state, the council used simply "Libya". The UN formally recognized the country as "Libya" in September 2011, based on a request from the Permanent Mission of Libya citing the Libyan interim Constitutional Declaration of 3 August 2011. In November 2011, the ISO 3166-1 was altered to reflect the new country name "Libya" in English, "Libye (la)" in French. After popular movements overturned the rulers of Tunisia and Egypt, Libya's immediate neighbours to the west and east, Libya experienced a full-scale uprising beginning in February 2011. By 20 February, the unrest had spread to Tripoli. Much of Libya had slipped out of Gaddafi's control, falling to anti-Gaddafi forces. Eastern Libya, centered around the second largest city and vital port of Benghazi, was firmly under the control of the opposition. The opposition began to organise themselves into a functioning government. Anti-Gaddafi forces marched on Sirte (Gaddafi's hometown) on 28 September 2011. Gaddafi loyalists delayed the attack with the use of their snipers. The fight for Sirte ended on 20 October with the capture of the town and the death of Colonel Gaddafi. On 24 February 2011, politicians, former military officers, tribal leaders, academics and businessmen held a meeting in the eastern city of Bayda. The meeting was chaired by former justice minister Mustafa Abdul Jalil, who quit the Jamahiriya government a few days before. The delegates discussed proposals for interim administration with many delegates asking for UN intervention in Libya. The podium at the meeting displayed the pre-Jamahiriya flag. On 25 February, Al Jazeera TV reported that talks were taking place between "personalities from eastern and western Libya" to form an interim government for the post-Gaddafi era. The following day, former justice minister Mustafa Abdul Jalil was announced to be leading the process of forming an interim body, to be based in Benghazi. Jalil stated that "Gaddafi alone bore responsibility for the crimes that have occurred" in Libya; he also insisted on the unity of Libya and that Tripoli was the national capital. The efforts to form an alternative government have been supported by the Libyan ambassador in the United States, Ali Suleiman Aujali. The Libyan deputy ambassador to the United Nations, Ibrahim Omar Al Dabashi, stated that he supported a new alternative government "in principle". A National Transitional Council was formed on 27 February to act as "the political face of the revolution". Its spokesman, Abdul Hafiz Ghoga, made clear at the launch press conference that the national council was not a provisional government and added that the newly formed council was not in contact with foreign governments and did not want them to intervene. He later clarified that an airstrike mandated by the United Nations would not be considered a foreign intervention. An Al Jazeera journalist in Benghazi reported that a fully fledged interim government would not be formed until Tripoli was under opposition control. This contradicted Jalil's statement of the previous day about the formation of a provisional government. These comments were later clarified by the council as Jalil's "personal views". On 5 March, the council issued a statement in which it declared itself to be the "sole representative of all Libya". Mustafa Abdul Jalil was named as chairman of the council. On 10 March, France became the first country to recognise the council as Libya's only legitimate government. On 23 March, the council established an Executive Board to act as a transitional government for Libya. Jibril, who had served as chairman of the informal "executive team" since 5 March, was appointed as Chairman of that board, stating that council would serve as the "legislative body", and the new Executive Board would serve as the "executive body". Jibril led the meeting and negotiations with French President Nicolas Sarkozy, a meeting that resulted in France officially recognizing the council as the sole representative of the Libyan people. In mid-January 2012, protesters against the NTC stormed its Benghazi headquarters, demanding greater transparency on expenditures, that Gaddafi-era officials be sacked, and that Islamic sharia law be the source of the country's future constitution. Jalil was in the building, but slipped out the back before protesters broke in and stole computers and furniture. A few days earlier, Abdul Hafiz Ghoga, vice president of the NTC, was surrounded and jostled by a group of university students in Benghazi, before being pulled to safety by supporters. In a ceremony on 8 August 2012—held in the evening due to the daytime fast of Ramadan—the NTC formally transferred power to the General National Congress. Jalil stepped down as chairman, passing the position to the GNC's oldest member, Mohammed Ali Salim. The NTC was then dissolved, while the GNC members took their oath of office, led by Salim. Hundreds of people gathered in Tripoli's Martyrs' Square with candles symbolizing reconciliation. The date of the transfer—20 Ramadan on the Islamic calendar—had also been selected for symbolic reasons, as 20 Ramadan the previous year had fallen on 20 August, the date that the rebels attacked Tripoli, leading to Gaddafi's flight. As Jalil addressed the crowd, attendees chanted "Allahu Akbar!" or another phrase meaning "The blood of martyrs will not go wasted!" According to BBC News, the transfer was "the first peaceful transition of power in Libya's modern history", meaning the history since the end of the monarchy. Supervision of the Military Council to ensure the achievement of the new doctrine of the Libyan People's Army in the defense of the people and to protect the borders of Libya. In another statement clarifying the goals for a post-Gaddafi Libya, the council committed itself an eight-point plan to hold free and fair elections, draft a national constitution, form political and civil institutions, uphold intellectual and political pluralism, and guarantee citizens' inalienable human rights and the ability of free expression of their aspirations. The council also emphasized its rejection of racism, intolerance, discrimination, and terrorism. Article 1 further declares Tripoli the state capital and Arabic the official language while reserving the linguistic and cultural rights of ethnic minorities as well as the freedom of religion for religious minorities. The stated aim of the NTC was to form a de jure interim government based in Tripoli and hold elections for a General National Congress to replace it. The GNC would then elect a prime minister, appoint a Constituent Assembly to draft a constitution subject to its approval by the Public National Conference (PNC) and by referendum, and then oversee free elections for a representative government. 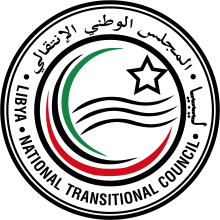 The National Transitional Council claimed to be, and was widely recognized as, the "only legitimate body representing the people of Libya and the Libyan state". Starting off at 33 members, it rose to 51, with proposals to increase its size further to 75 or even 125. Al Jazeera English reported that each city or town under opposition control will be given five seats on the new council and that contact will be established with new cities that come under opposition control to allow them to join the council. The identities of members of the council were not disclosed at the launch conference. Human Rights lawyer Hafiz Ghoga was the spokesperson for the new council. An Al Jazeera English journalist in Benghazi stated that Mustafa Abdul Jalil still had a leadership role within the new council. The Council declared that Jalil was the head of the council. The council met formally for the first time on 5 March 2011 when it was announced that the council had 33 members. The names of some of the members were kept secret to prevent threats to their families that were still in Gaddafi-held areas of Libya. In September 2011, some of the NTC's members were in Benghazi, while some had moved to the de jure capital Tripoli. On 8 September, the head of government Mahmoud Jibril became the highest-ranking NTC official yet to move to Tripoli. Prior to Jibril's relocation, Deputy Chairman Ali Tarhouni was the de facto leader of the NTC in Tripoli. AbdAllah Banoon of Tripoli resigned to form a political party. On 5 March 2011, a crisis committee was set up to act as the executive arm of the council. An Executive Board was announced on 23 March 2011. It originally had 15 members, but a minor reorganisation apparently removed the post of Military Affairs from the council proper and created a successor position for Defence on the board, expanding the bureau to 16 members. The Executive Board was dismissed on 8 August 2011 due to administrative mistakes in investigating the assassination in July of Free Libyan Army commander General Abdel-Fatah Younes. Chairman Mahmoud Jibril, the only designated member of the Executive Board who was not fired, was tasked with forming a new Board. A new cabinet was unveiled in early October 2011, though not all of its members were announced at once. Individuals confirmed to be part of the new board included Mahmoud Jibril as prime minister, Ali Tarhouni as deputy prime minister, and Jalal al-Digheily as defence minister. On 23 October, Jibril resigned as Mustafa Abdul Jalil declared an end to the Libyan civil war, and Abdurrahim El-Keib succeeded him as prime minister on 31 October. The executive board was dissolved on 22 November 2011 as per the Interim constitution which stated that the Executive board must be dissolved upon the formation of the Interim Government. During the war, in opposition-held Benghazi, a 15-member "local committee" made up of lawyers, judges and respected local people was formed in order to provide civic administration and public services within the city. Residents have organised to direct traffic and collect refuse. Many shops and businesses have opened again. A newspaper and two local radio stations were also established. Similar "local committees" were formed in other cities controlled by opposition groups. The Central Bank of Benghazi – to act as the "monetary authority competent in monetary policies in Libya"
Libyan Oil Company – to act as the "supervisory authority on oil production and policies in the country"
The anti-Gaddafi forces were Libyan armed forces which were constituted during the 2011 war by defected military members and armed citizens in order to engage in battle against remaining members of the Jamahiriya's armed forces, hired mercenaries and paramilitary loyal to the rule of Muammar Gaddafi. The National Liberation Army, formerly known as the Free Libyan Army, was the NTC's military arm, with the small Free Libyan Air Force operating assets including captured and defected fighter jets and helicopters. Omar El-Hariri was the first military affairs minister the NTC named, holding that position from 23 March 2011 forward. By 19 May 2011, however, Jalal al-Digheily had replaced El-Hariri. Then on 8 August 2011, Digheily along with 14 other members of the Executive Board were fired and the position left vacant, but was reappointed in early October 2011 after continuing in the role of interim defense minister for almost two months. Then on 22 November 2011, the Executive Board was dissolved for the formation of the Interim Government and Osama al-Juwali became the new Defense Minister. On 1 April 2011, Abdul Fatah Younis was announced as commander of the NTC's forces, in an attempt to form an organized fighting structure due to a string of failures. Younis was killed in an attack on 29 July 2011 which was variously blamed on pro-Gaddafi agents, rogue rebel militiamen, and the NTC itself. Suleiman Mahmoud, Younis's top lieutenant, replaced him as army commander. In July 2011, the Libya Contact Group of representatives of many nations announced its participants' agreement to deal with the National Transitional Council as the "legitimate governing authority in Libya". The council also received the backing of the Arab League and the European Union. On 16 September 2011, the United Nations General Assembly voted to award Libya's UN seat to the NTC. On 20 September 2011, the African Union officially recognised the NTC as the legitimate representative of Libya. Mohammed El Senussi, the pretender to the throne of Libya, also voiced his support for the NTC. While NTC forces were working to secure military victory on the ground, the NTC's chairman, Mustafa Abdul Jalil, was working to foster good diplomatic relations overseas. Before Gaddafi was killed Abdul Jalil negotiated a deal with the British government to pay millions in compensation to victims of IRA attacks that used Jamahiriya-supplied arms. United Nations Security Council Resolution 1973 authorised a multi-national effort to establish a no-fly zone. On 19 March, British, French and US air forces began attacking targets in Gaddafi-controlled Libya, thereby initiating the UN military intervention. Operations were led by NATO under Operation Unified Protector, after initially being led by a joint UK, US and French command. Non-NATO states such as Jordan, Qatar, Sweden, and the United Arab Emirates also contributed to the military mission. ^ "Name change for Libya" (PDF). Iso.org. Retrieved 30 September 2018. ^ "The US recognises Libya's Transitional National Council". World Socialist Web Site. 20 July 2011. Retrieved 29 July 2011. ^ Libya's transitional rulers hand over power, Boston.com, 8 August 2012. ^ a b "Ferocious Battles in Libya as National Council Meets for First Time". NewsCore (via news.com.au). 6 March 2011. Retrieved 6 March 2011. ^ a b The Interim Transitional National Council Decree 3. 5 March 2011. ^ a b c d "Founding Statement of the Interim Transitional National Council". National Transitional Council. 5 March 2011. Archived from the original on 7 March 2011. Retrieved 7 March 2011. ^ "Excerpts from Libya Contact Group Chair's Statement". Reuters. 15 July 2011. Retrieved 25 July 2011. ^ a b Lederer, Edith (16 September 2011). "UN approves Libya seat for former rebels". San Jose Mercury News. Retrieved 16 September 2011. ^ "United Nations interoffice memorandum dated 16 September 2011 from Desmond Parker, Chief of Protocol, to Shaaban M. Shaaban, Under-Secretary-General for General Assembly and Conference Management, attaching memorandum from Stadler Trengove, Senior Legal Officer". Unterm.un.org. Retrieved 5 February 2013. ^ "ISO 3166-1 Newsletter VI-11: Name change for Libya" (PDF). International Organization for Standardization. 8 November 2011. Retrieved 13 December 2011. ^ "Live Blog – Libya". Al Jazeera. 17 February 2011. Retrieved 23 February 2011. ^ "News | Libya February 17th". Libyafeb17.com. Retrieved 23 February 2011. ^ Burgess, Joe; Fahim, Kareem (25 February 2011). "Map of How the Protests Unfolded in Libya". The New York Times. Retrieved 26 February 2011. ^ "Libya's Col Muammar Gaddafi killed, says NTC". BBC News. 20 October 2011. Retrieved 20 October 2011. ^ "Spotlight Libya". Al Jazeera English. Retrieved 25 March 2011. ^ Staff (25 February 2011). "Discussions Under Way for Provisional Government in Libya". Malta Star. Retrieved 17 August 2011. ^ a b "New Government Forms in Eastern Libya". NPR. 23 February 2011. ^ "Libya's Eastern Rebels Long Time Qaddafi Foes Driving Revolt". Bloomberg Businessweek. 25 February 2011. Archived from the original on 28 February 2011. ^ "Terror in Tripoli as pressure builds in Yemen". CBN News. Agence France-Presse. 26 February 2011. Retrieved 8 August 2012. ^ "Live Blog". Al Jazeera. 26 February 2011. Archived from the original on 1 March 2011. ^ "Ex-Libyan Minister Forms Interim Government: report". lse.co.uk. Reuters. 26 February 2011. Retrieved 8 August 2012. ^ Arshad Mohammed (26 February 2011). "Update 1-Exclusive-Libya Envoy to U.S. Backs Interim Government". Reuters. Retrieved 8 August 2012. ^ "Live Blog – Libya". Al Jazeera. 27 February 2011. Archived from the original on 8 March 2011. ^ "Interim Libyan Govt Wins Support". Al Jazeera. 27 February 2011. Retrieved 17 August 2011. ^ Abbas, Mohammed & Blair, Edmund (28 February 2011). "Anti-Gaddafi Figures Say Form National Council". Reuters. Retrieved 8 August 2012. ^ a b "Libya Opposition Launches Council". Al Jazeera. 27 February 2011. Retrieved 5 March 2011. ^ Fahim, Kareem; Kirkpatrick, David D. (1 March 2011). "Libyan Rebels Said To Debate Seeking U.N. Airstrikes". The New York Times. Retrieved 5 March 2011. ^ "Libya: France recognises rebels as government". BBC News. 10 March 2011. Retrieved 8 August 2012. ^ למען מיסראתה: מטוסי המערב תקפו טנקים [For Misrata: Western planes attacked tanks]. Maariv (in Hebrew). Associated Press. 23 March 2011. Retrieved 8 January 2012. ^ a b "Libyan Air Force 'No Longer Exists'". Al Jazeera. 23 March 2011. Retrieved 23 March 2011. ^ "Libyan protesters storm government headquarters in Benghazi". Al Arabiya. 21 January 2012. Retrieved 8 August 2012. ^ Malvika Tegta (22 January 2012). "Libya's NTC faces protesters' wrath as it grapples with transition". Firstpost.com. Retrieved 8 August 2012. ^ a b c "Libya's NTC hands power to newly elected assembly". BBC News. 8 August 2012. Retrieved 8 August 2012. ^ a b Gumuchian, Marie-Louise & Shuaib, Ali (8 August 2012). "Libya's ruling council hands over power to new assembly". Reuters. Retrieved 8 August 2012. ^ "Libya's transitional council hands over power". CNN. 8 August 2012. Retrieved 8 August 2012. ^ إعلان تاسيس المجلس الوطني الانتقالي المؤقت | الجمهورية الليبية - المجلس الوطني الانتقالي (in Arabic). National Transitional Council. 19 March 2011. Retrieved 25 March 2011. ^ "A vision of a democratic Libya". The Guardian. 29 March 2011. Retrieved 8 August 2012. ^ "A Vision of a Democratic Libya" (PDF). Al Jazeera. 29 March 2011. Retrieved 8 August 2012. ^ Birsel, Robert (31 August 2011). "Libya's new rulers set out steps to elections". Reuters. Retrieved 24 October 2011. ^ "Introducing the Council | The Libyan Republic - The Interim Transitional National Council". National Transitional Council. Retrieved 10 March 2011. ^ a b "Abdul Raheem al-Keeb elected Libya's interim PM". Libya TV. 1 November 2011. Archived from the original on 3 November 2011. ^ David Rolfes (29 June 2011). "The National Democratic Institute Update on Libya June 29, 2011" (PDF). omarturbi.org. Retrieved 19 September 2011. ^ "Council Members". National Transitional Council. 5 March 2011. Archived from the original on 7 March 2011. Retrieved 7 March 2011. ^ Rolla Scolari (6 March 2011). "Council Says It's Libya's Sole Representative". The National. Retrieved 8 August 2012. ^ "Thursday, September 8, 2011 - 17:28 GMT+3 - Libya". Al Jazeera. 8 September 2011. Retrieved 8 September 2011. ^ "The Libyan Interim National Council". National Transitional Council. Retrieved 2 June 2011. ^ Murphy, Dan (2 September 2011). "The members of Libya's National Transitional Council". The Christian Science Monitor. Retrieved 19 September 2011. ^ "List of NTC Members 1 of 2" (in Arabic). twitpic.com. Retrieved 23 December 2011. ^ "Libyan Rebels Form 'Interim Government'". Al Jazeera. 22 March 2011. Retrieved 25 March 2011. ^ a b . National Transitional Council. ^ "Libyan Rebel Leader Sacks Executive Branch of Transitional Council". Al Arabiya. 8 August 2011. Retrieved 9 August 2011. ^ "Libya Live Blog". Al Jazeera. 9 August 2011. Retrieved 9 August 2011. ^ Stephen, Chris (9 August 2011). "Libyan rebel leader sacks entire cabinet". The Guardian. Retrieved 8 August 2012. ^ "Libyan Opposition Dissolves Leadership Board". Al Jazeera. 8 August 2011. Retrieved 8 August 2011. ^ "New cabinet takes shape in Libya". Al Jazeera. 2 October 2011. Retrieved 2 October 2011. ^ Daragahi, Borzou (23 October 2011). "Libya declares liberation after Gaddafi's death". Financial Times. Retrieved 23 October 2011. ^ Schemm, Paul (24 February 2011). "Libya's Second City, Benghazi, Learns To Govern Itself After Decades of Oppression". Guelph Mercury. Associated Press. Retrieved 5 March 2011. ^ a b "BBC Libya Live Coverage". BBC. Retrieved 4 March 2011. ^ "First Edition of the Benghazi Newspaper". feb17.info. 24 February 2011. Retrieved 5 March 2011. ^ "Founding statement of the Interim Transitional National Council | The Libyan Republic - The Interim Transitional National Council". National Transitional Council. Retrieved 10 March 2011. ^ Garcia-Navarro, Lourdes (23 February 2011). "New Government Forms in Eastern Libya". NPR. Retrieved 5 March 2011. ^ "Meeting Outcomes of the Interim National Council Held on 19 March 2011". National Transitional Council. 19 March 2011. Retrieved 25 March 2011. ^ Varner, Bill (21 March 2011). "Libyan Rebel Council Forms Oil Company To Replace Qaddafi's". Bloomberg. Retrieved 25 March 2011. ^ "Libya: The Colonel Feels the Squeeze". The Economist. 19 May 2011. Retrieved 6 August 2011. ^ "Jibril vows to quit after Libya 'liberation'". Al Jazeera. 3 October 2011. Retrieved 3 October 2011. ^ "Rebel head Abdel-Fattah Younis Killed". Daily Mirror. 28 July 2011. Retrieved 8 August 2012. ^ "Libyan Rebel Military Leader Is Killed". Sky News. 29 July 2011. Retrieved 8 August 2012. ^ Al-Shaheibi, Rami (29 July 2011). "Officer accuses fellow rebels in Libya killing". USA Today. Associated Press. Retrieved 29 July 2011. ^ "Excerpts from Libya Contact Group Chair's Statement". Reuters Africa. Reuters. 15 July 2011. Retrieved 16 July 2011. ^ Black, Ian (15 July 2011). "Libyan Rebels Win International Recognition as Country's Leaders". The Guardian. Retrieved 16 July 2011. ^ "Libyan Regime 'Lost Legitimacy'—Arab League". Philippine Daily Inquirer. Agence France-Presse. 13 March 2011. Retrieved 25 March 2011. ^ "Foreign Minister Radosław Sikorski Visits Benghazi". Polish Ministry of Foreign Affairs. 11 May 2011. Retrieved 20 May 2011. ^ "African Union officially recognises Libya's new leadership". Google News. Agence France-Presse. 20 September 2011. Retrieved 8 January 2012. ^ "Libya's 'Exiled Prince' Urges World Action". Khaleej Times. Agence France-Presse. 9 March 2011. Retrieved 10 March 2011. ^ O’Cleirigh, Fiona (20 October 2011). "UK and new Libyan leaders agree deal for IRA victims". Exaro news. Retrieved 30 January 2012. Wikinews has related news: France first to recognise Libyan rebels as "legitimate representatives of the people"